September has provided glorious sunshine, surprisingly high temperatures and some excellent soaring opportunities. The final weekend gave us wall to wall sunshine and the launch point was busy. 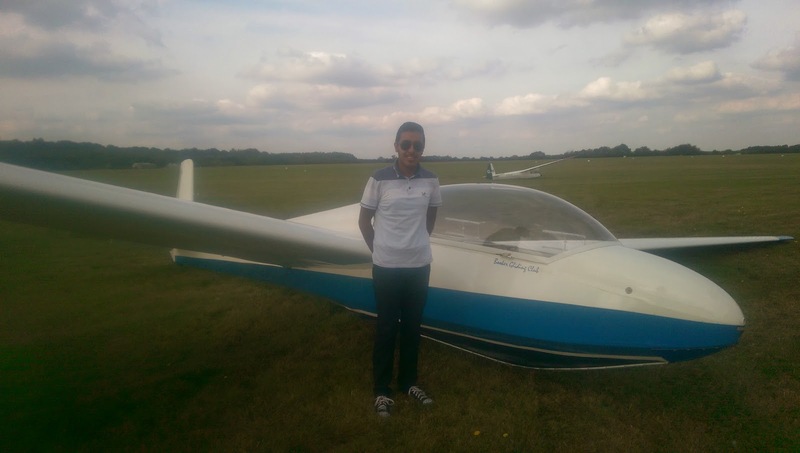 Amongst all the other activity, cadet Mohammed Ali achieved his first solo. Our visit this year to the Henley Show was very different from last year - for a start it didn't rain. The sun brought out large crowds of people and we had an endless stream of small people wanting to sit in the glider. There was also a lot of genuine interest in gliding and we made a number of sales - visitors seemed much more willing to part with money than has been the case in the past couple of years. When not working on the stand, the members of the team took turns to go and take a look at the other attractions - the food tent was a particular favourite, and we came away laden with cheese, pickles and other delicacies. Many thanks to Graham Saw and Nick Newton for helping us to set up on Friday evening - Graham plainly has supernatural powers as under his direction the Junior allowed its wings to be rigged without the usual struggle. Also thanks to Hedda Coture for tirelessly lifting small children in and out of the cockpit, to Jon Sugden who deserved a rest after his school visit yesterday, to David Humphreys, William Parker and of course Chris Collett. Back to school for the cadet fundraising project. The clubs ASW 19 visited Oak Green Primary School today in Aylesbury. Each term the school has a chosen topic, which they begin with a 'wow day'. The topic this term is inventions with a focus on planes and the ASW 19 definitely delivered the wow factor, although a few were disappointed that it had arrived in a trailer and not flown in! It was great to introduce gliding to young people and the school have donated £200 to the cadet glider project. We are hoping to run school visit days at the club in the future so if anyone knows a school that might be interested please let me know.